Looking for a luxury cabinet brand that checks all of your boxes? Rutt Cabinetry is one of those brands that’s eagerly recommended by our design staff based on quality, design, and unique customization options. Rutt HandCrafted Cabinetry is a time-tested American made brand that is known for its high-quality deserving of its reputation and rich heritage. Originating from the Pennsylvania countryside, Rutt HandCrafted Cabinetry only employees the most skilled craftspeople in the trade. Committed to being American made and environmentally responsible, Rutt HandCrafted Cabinetry is truly one of the best custom cabinetry options available. Rutt’s unique trendsetting architectural designs and unparalleled quality make it a perfect option for our clients unaccustomed to compromise. Here is a few of our recent Rutt kitchen remodeling projects with Drury Design’s designers’ thoughts and comments. High contrast and rich tones set a dramatic stage for this Rutt cabinetry project. Despite its expansive size, this kitchen was designed to create a feeling of intimate proximity for each workstation. Whether enjoying a family meal at the island, cooking on the large Wolf range, or waiting for your pizza to cook in the integrated wood-burning pizza oven. This open kitchen design ensures everyone has room and is included. “These homeowners were drawn to Rutt HandCrafted Cabinetry’s Ruskin series because of the unique architectural details that the line is known for. These details can be found in the island legs and arch details” – Diana Burton. To see more of this kitchen remodel, also visit Family Inspired Luxury Kitchen Design. This light and airy kitchen boasts beautifully contrasting beaded inset Rutt cabinetry with plenty of expertly disguised appliances. Designed to be the centerpiece of this home, the kitchen has enough room for the whole family to settle in for a meal or spread out to do homework. The two-toned cabinetry became the inspirational color pallet for the rest of this home’s makeover and is carried into the homes new double butlers pantries, mudroom and powder room. 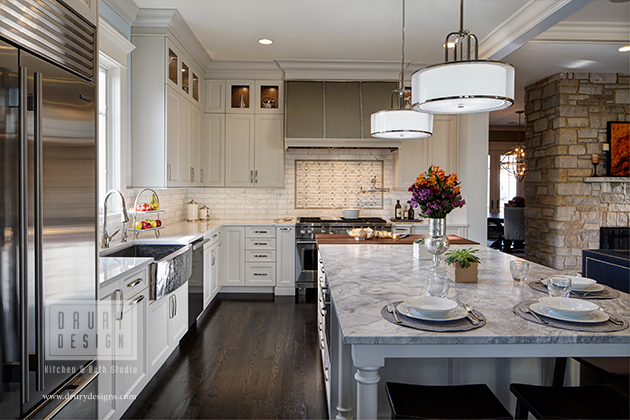 “My clients sought handcrafted, quality-made cabinetry for their Kitchen remodel. It was important to them to incorporate a cabinet line that would maximize the design potential for their space both aesthetically and functionally. Rutt provided them with the customization they had wanted in order to add those special touches to their Kitchen, such as the walnut drawer boxes and accessories, the hand-selected walnut and maple wood for their cabinets and the custom grey glazed finish for their perimeter cabinetry” – Alicia Saso, AKBD. To see more of this kitchen remodel, also visit Family Focused Luxury Kitchen Renovation. The new homeowners wanted to make the home truly feel like there’s. Despite only being 10 years old, they ripped out the dark drab cabinetry and replaced it with light gray floor-to-ceiling Rutt cabinetry. The tall 57” inch upper cabinets add a dramatic touch and feature German antique glass inserts to display the homeowner’s special pieces. Storage and function were on the top of the homeowner’s wish list, open any cabinet or drawer and you can see the full extent of Rutt accessories and specialized storage solutions. The large island now seats the family of four comfortably while gracefully opening up to the families living room to provide the perfect entertainment atmosphere. 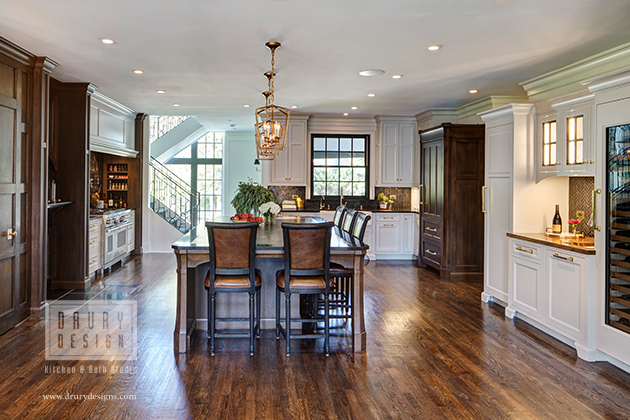 “My clients knew they wanted to use Rutt HandCrafted Cabinetry when they embarked on their kitchen remodel. With a career that has relocated this family throughout the country, it was important to them to use a brand that was familiar and time-trusted” – Linda Larish, CMKBD. To see more of this kitchen remodel, also visit Open Concept Kitchen Featuring Rutt Cabinetry. Looking to get started on your own remodel project? Reach out to us today and schedule a complimentary design consultation. See you soon!